Some of today's most significant writers and poets explore the relation between what we call the sacred and what we witness in the apparent world. This unprecedented anthology brings together a provocative mix of new and well known writers whose poetry and prose broaches the possibility of something "bigger" going on, something more significant at stake. Is some powerful agency at work in what we see or are we just wishing (or fearing) that there were? Who can say? Who would dare? What’s most intriguing about the selections in this volume is that the authors do dare. What’s most attractive about them is that they resist answering that dare with reductions. They prefer the swoon of multiple possibilities over the relative comfort of conclusions. 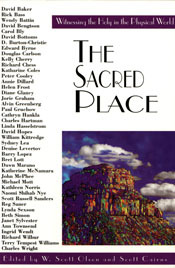 Various as they are, the works collected in The Sacred Place share a common reverence for the word itself, and perhaps best of all—they share a common understanding that no one of them comprehends fully what that means. They seem to desire instead a sense that the humble stuff surrounding us affords a likely enough habitation for the sacred, even now.